This year’s Oxford Lieder Festival takes as its theme ‘The Grand Tour’, restricting itself not to the aristocratic journey around the sites of Classical and Renaissance Italy, but casting its net widely to encompass a much broader exploration of art song around Europe. But nor is the theme to do with travel per se and indeed, except for this programme’s clear geographical progression from France, to Germany, and ending up in Italy, and the unusual addition to a Lieder recital of a horn, there was no more concrete theme to connect the disparate threads of Louise Alder’s offerings in this concert. The more extrovert and dramatic settings here played better to her considerable vocal strengths in being able to declaim a line or paragraph with bracing and forceful directness, particularly in the settings by Richard Strauss which demand musical vigour as well as poetry. ‘Ständchen’ was rapturous and extravagant, whilst ‘Nichts’ combined similar urgency with winning humour too. ‘Zueignung’ was comparatively measured, almost lacking direction, but it was no less eloquent for that. In the little-known early song ‘Alphorn’ Alder responded to Stef van Herten’s horn calls from the side of the stage with the yearning ardour described in Justinus Kerner’s poem. The selection of the four songs from Schumann’s Op.98a cycle which set the words of Mignon from Goethe’s Wilhelm Meister also called forth an almost operatic range of expression from Alder with the variously assertive and regretful intensity of ‘Heiss’ mich nicht reden’ and ‘So lasst mich scheinen’; and the outbursts of passion, wonderment, and confusion of the famous ‘Kennst du das Land?’. That foreshadowed the genuine melodrama of the songs from that country alluded to in the latter song, Italy. 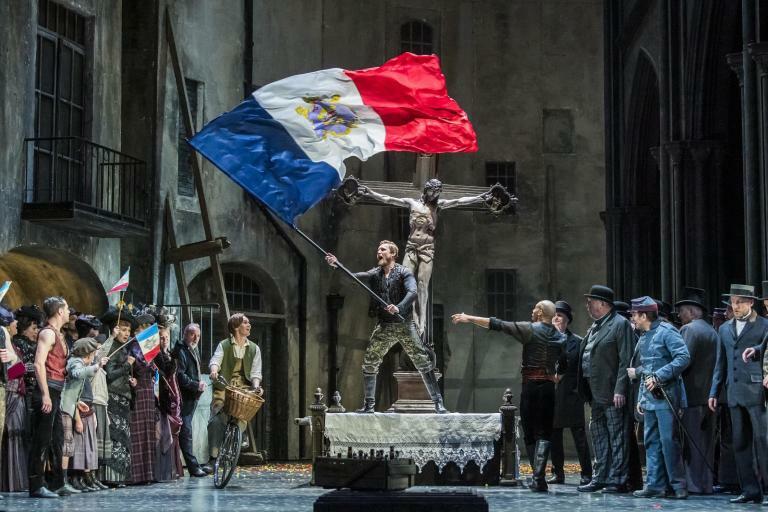 The strongly lyrical bent – delivered powerfully by Alder – of Puccini’s song ‘Morire?’ could have come from his contemporary operetta La rondine, whilst her frolicsome way with Verdi’s ‘Stornello’ and mischievous characterisation of the chimney sweep in the eponymous ‘Lo spazzocamino’ revealed a rarely-seen, if still recognisable, comic aspect of that composer, even if these songs perhaps required more delicate charm. Her ability to sustain a seamless bel canto line with vigorous allure found an attractive outlet in Donizetti’s ‘L’amor funesto’ to conclude the programme with the accompaniment of the horn again. Alder’s tendency to strike a bold musical pose did not suit Debussy’s early Ariettes oubliées so well – a more subtly coloured and mysterious tone would have characterised better the rarefied nature of these six settings which already combine all the hallmarks of the composer’s style. Although ‘C’est l’extase’ captured the languorous rapture referred to in Verlaine’s text with a yearning immediacy at the beginning, the rest of the performance was perhaps too clean and crisp, and the extrovert outbursts of joy or desperation here and in ‘Spleen’ for example made them too operatic and sensational. The delivery of ‘hélas’ at the end of latter song as like sigh and the suggestive repetition of ‘tournez’ in ‘Chevaux de bois’ were effective, however, as were Sholto Kynoch’s atmospheric accompaniments which were already redolent of later piano pieces by Debussy: the rippling accompaniment of ‘Il pleure dans mon cœur’ evoking one of the Arabesques, and the veiled tolling like a bell of ‘L’ombre des arbres’ anticipating Cloches à travers les feuilles. Van Herten’s contributions on the horn neatly introduced the Debussy and Strauss selections with, respectively, a mellow account of ‘Larghetto’ from Gounod’s Six Mélodies (1840) and an elegiac but purposeful arrangement of the first of Schumann’s three Romances Op.94 (originally written for oboe), though some split notes marred the effect of both. He joined Alder in the Schubertian lilt of Conradin Kreutzer’s ‘Das Mühlrad’, though with some problems in tuning, and a more settled account of Franz Lachner’s version of a song from Adelbert von Chamisso’s Frauenliebe und –leben (‘Er, der Herrlichste von allen’) where the almost Mozartian turn of phrase elicited bright and joyful singing, although its intimacy was over-dramatised by Alder. As an encore all three performers joined together for a charming arrangement of the ‘Evening Benediction’ from Humperdinck’s Hänsel und Gretel, though this lacked some innocence and sweetness as singer and horn player pressed on with a little too much heft, detracting from the special mood it needs. A hotchpotch of a programme provided tantalising variety, then, without quite offering the opportunity to explore any given theme or emotion consistently, but it was the occasion for some strongly characterised and involving music-making. For more about Oxford Lieder click here.